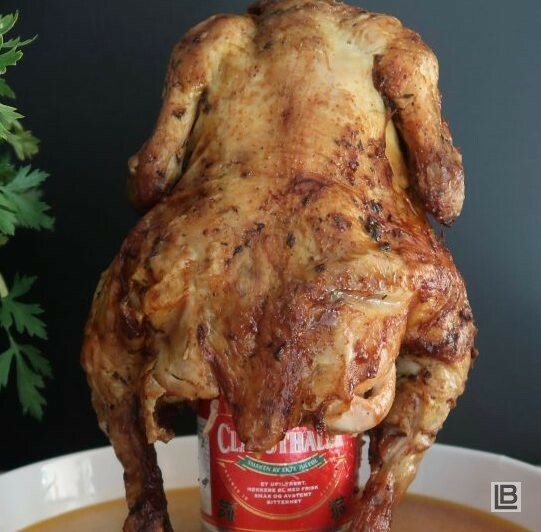 Beer can chicken is not a new invention, but it goes through stages where you see it on every food-bloggers page and then it just dies off until it is revived again. I don’t really care if it is fashionable or not, I do however know that it is one of the best ways to ensure you have a moist and succulent whole roast chicken. It is one of those no-fuzz recipes where you can put the chicken in the oven or BBQ and get on with everything else. This is a wonderful recipe in summer time with roast or baked potatoes and a salad. I have also developed a beer salad dressing if you want to keep the theme going with all things “beer”. All my beer recipes was developed for Clausthaler Norway which is a non-alcoholic beer. You are not allowed to advertise alcoholic drinks in Norway, but you can work this one out right? The recipe is available in Norwegian on the website of Kiwi. Clean the chicken under cold water and remove any giblets (if any) and pat dry with paper towels. Place a large baking dish on a roasting pan to prevent a total mess in your oven. Open the can of beer with a can opener and pour about ¼ of it into the baking dish and set the beer can in the centre of the baking dish. Sprinkle over the rub and use your hands to massage it into all the nooks and crannies. Place the chicken upright over the beer can and drizzle the chicken with olive oil. Bake in the oven for about 1 hour until golden and cooked through. To check to see if it's done, insert a knife into the thickest part of the thigh. The juices should run clear. If not, leave it in a little longer. Serve with a side of roast or baked potatoes and a salad with beer salad dressing.